Sterling has enjoyed a superb campaign with reigning Premier League champions Manchester City, scoring 19 goals in all competitions and netting the decisive penalty as Pep Guardiola's team retained the EFL Cup with a shoot-out triumph over Chelsea at Wembley. Kane and Sterling are set to combine in England's forward line for the opening Euro 2020 qualifiers against Czech Republic and Montenegro over the coming week, before they take their places on either side of a Champions League quarter-final showdown between Tottenham and City. "Raheem has had an amazing season again," Kane told a news conference at England's St George's Park training base. "They've won one competition, they're still in all the others and Raheem has been a big part of their success so far. "He's a great lad, great player and I'm looking forward to playing with him in the games for the next week or so. "He'll definitely be in with a shout for player of the year." Despite established City and Liverpool contingents in Gareth Southgate's squad as a nip-and-tuck Premier League title race reaches boiling point, Kane insists focus on international matters is unwavering for last year's World Cup semi-finalists. "Obviously we've had a bit of banter and stuff. 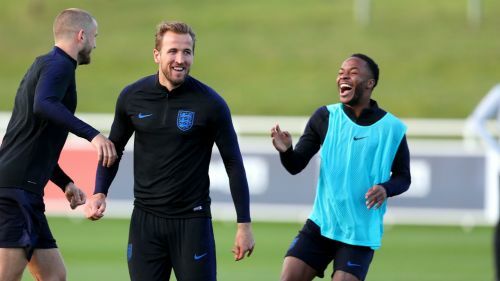 I think the great thing about this team and this England camp is we have a bit of fun and a laugh and a joke," he said. "But we know that when we're here it's all about England and we put that to one side. Even with the Liverpool and the City boys, when we're here it's 100 per cent England. "When we go back I'm sure there'll be a couple of text messages and group messages flying about. "We've got a great bond here and we're good friends, whether we play for one club or the other. We all get on very well. "When we're at our clubs it's 110 per cent to try and beat each other but we have that respect where we can talk after and be friends." He added: "It's going to be a tough battle. The top six are so strong now. We're three points clear [of Arsenal in fifth] in the top four. It's in our own hands. "If someone had said third place and the quarter-final of the Champions League, with everything that's surrounding the club, it's not a bad position to be in so far."